I'm on a spree of making cranberry recipes! It all started with homemade cranberry sauce. I wanted something simple and quick so I made it with just three ingredients and made sure it was ready in about 15 minutes. Cranberry sauce is nice at Thanksgiving, but making something else fun with it is even better! And a brie appetizer? That's a winner anytime of the year. Baked brie cheese is really easy to make. Usually you quite literally just bake it and serve. But I wanted to add a touch of elegance and holiday flavor to it plus I had all that cranberry sauce to use up. So I decided top it with cranberry sauce and then add a flaky crust with some Pillsbury Crescent Rolls. Start by carefully tearing apart a square of four crescent rolls. Just unroll the dough and you should see where the square is at. Gently press on the perforations to seal them up. Next, add a spoonful of cranberry sauce right in the center of the rolls. Gently place the brie on top of the cranberry sauce. Top the brie with another spoon full or so of the cranberries. The next step is to cover the cranberries and brie with the crescent roll dough. It didn't look like the square crescent dough would actually cover the entire brie cheese round. It may have, but I wasn't sure. So I laid a rectangle of two more crescent rolls on top of the brie. Carefully pull the corners of the crescent square up and over the brie to cover it completely. It's a little bit like wrapping a present. Watch the bottom of the dough as it may tear. Brush the top and sides of the dough with a simple egg wash to help it brown when baking. The egg wash is not absolutely necessary, but it does make the dough brown and shiny in the end. Bake the brie on a parchment lined cookie sheet at 375 degrees for about 25-40 minutes. Mine was under baked at 30 minutes but it was getting brown on the outside so I took it out. I should have left it in another 5-10 minutes to let the cheese melt more. Just watch it closely and let it get really brown without burning. Remove the brie from the oven and allow it to cool for about 15 minutes before serving. 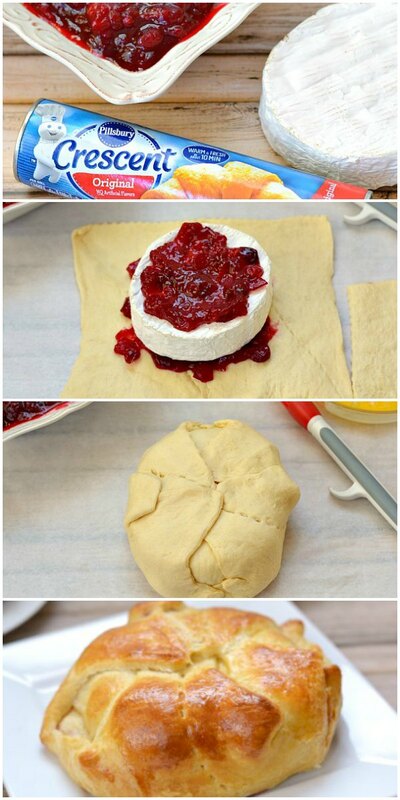 You can serve with crackers or just let people pull off the crescent dough and spread the brie right on it. Make sure to check out our Cranberry Crescent Rolls, too! Pre-heat oven to 350 degrees. Whisk egg in a small bowl and set aside. Gently tear apart the crescent dough so that 4 crescent rolls form a square. Press the perforations together so they don't tear apart and form one square of dough. Lay the dough out on a sheet of parchment paper. Put about 1/4 cup of cranberry sauce in the middle of the dough. Place the brie round on top of the cranberry sauce. Top the brie with more cranberries. 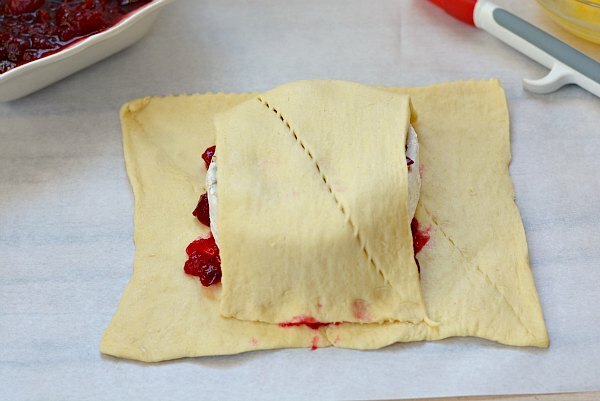 Tear apart a rectangle of 2 crescent rolls and lay them over on top of the cranberries on top of the brie. Fold the rest of the dough up and around the brie so it is encased in the dough. 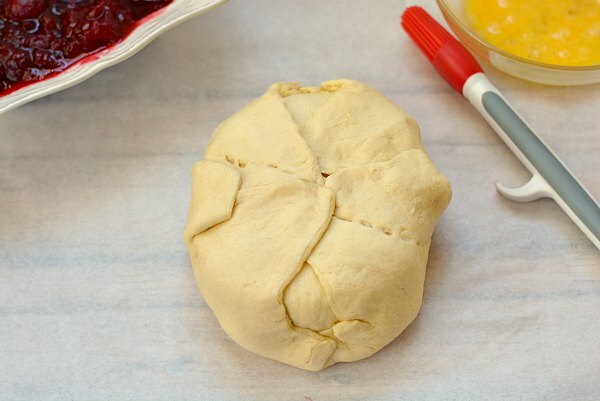 Brush the tops and sides of the dough with the egg. Place the parchment paper and brie on a baking sheet. Bake for at least 30 minutes, watching closely to make sure that the dough cooks through but doesn't burn. It should be a nice dark brown once done. Allow the brie to cool for 15 minutes before serving. Huge hit today!! Easy recipe, great presentation and delicious! Thanks for making our Christmas Merry! Is this an 8 oz brie? I want to make it but not sure size of brie. It says 375 in your description but when you go straight to the recipe it says 350! Which one is it!!? Looks amazing! Ack! Follow the directions on the can of crescent rolls and use that temperature. Are you sure the calorie count is 2714? No, the nutritional info may not be correct. It will depend greatly on your cheese and spread. I use red pepper jelly instead of cranberries, delicious and a great party appetizer! Thanks for this idea. I am planning to serve brie/cranberry at Christmas and was debating adding a couple of tablespoons of my homemade pepper jelly to the cranberry sauce. Your post has helped me decide to do it. Thanks! Can you reheat this after baking? Was going to take to a potluck at the office, but don’t have the luxury of baking it immediately prior to serving. I have never done it. You’d need to reheat it long enough to get the brie to melt and I’m afraid the crescent rolls would end up a little soggy. But I think a toaster oven would work. This really looked amazing so I thought I would try it out for Thanksgiving. My family did not find it appetizing and will not let it go. I expect a photo album forever commemorating their ridicule ( not kidding). I will post it here when I get the chance. So, my guess is, it’s not for everyone. Brie is definitely not for everyone! It has a very distinct flavor and is an aged cheese. Most people I serve it to love it but not everyone. I leave the the coating on and just cut through it once everything is baked. 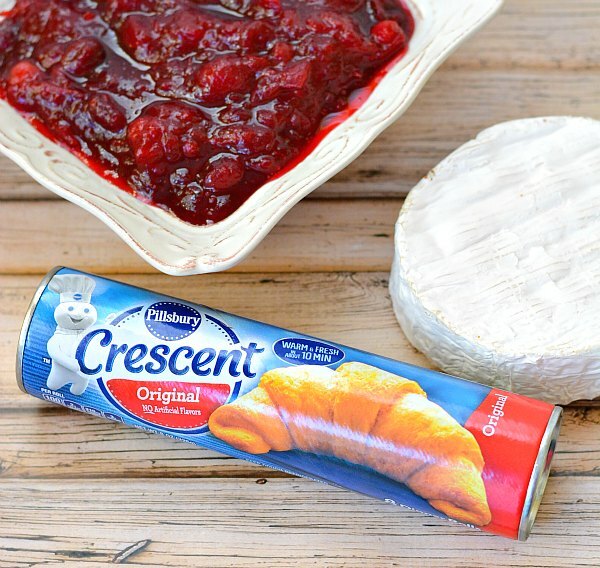 Then use the crescent roll to dip in the cheese and berries. Love this recipe. 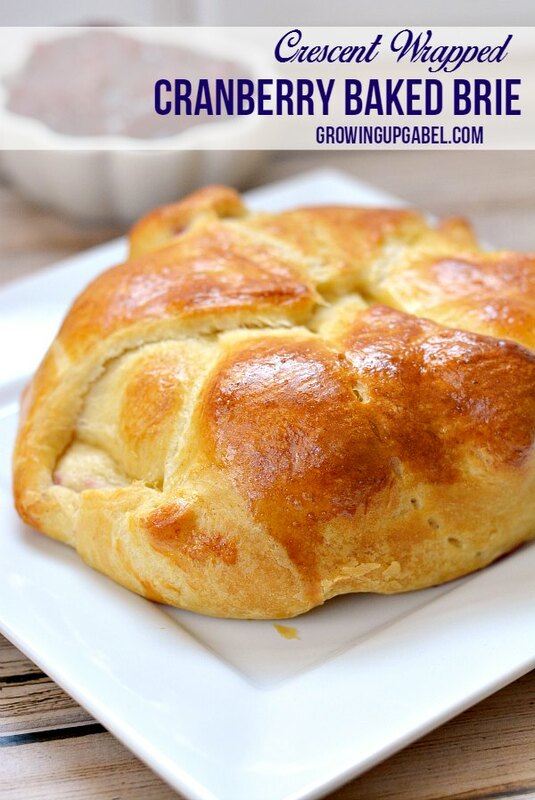 I made something similar with philo dough and apricot preserve. Thanks for the cranberry idea for Thanksgiving. I want to try the crescent roll wrap as well, but the grocery was out already this close to the holiday! I made this last night to try before Thanksgiving and it was delicious! I will definitely be serving it for Thanksgiving (and other nights as well!). Mine did brown quickly so I covered it in foil after half an hour so it could keep cooking for the full 40 minutes. This was very easy to make and looked beautiful. Also, while I’m sure homemade cranberry sauce would be wonderful, I used store bought cranberry sauce and it still tasted great. Thanks! Yes I’m sure store bought is just fine. 😉 Glad you liked it! Thanks for giving us some tips. Hi!! What would you serve this with?? Or do you cut a slice and just eat!? I want to make it for thanksgiving!! Looks amazing! Camille this is perfect! 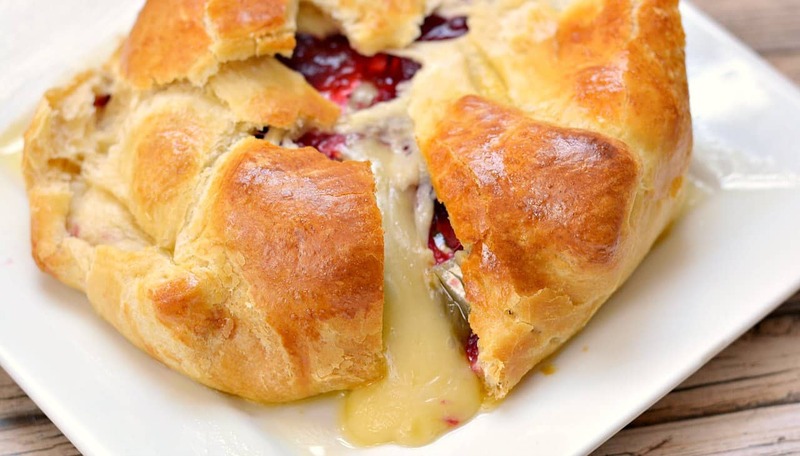 What a fantastic way to serve baked brie – that’s on my list for party food next weekend thank you! Thanks for sharing at Fiesta Friday – don’t forget to link up so your readers can come and join the party too! This recipe is even more simple than I thought it would be! I LOVE brie, especially when it’s melty and gooey. This is such a good idea, thanks for sharing! OMG!! This looks and sounds so delicious! Thanks for linking up to More the Merrier Monday. Can’t wait to see what you’ll be linking up next week. I love baked brie! I love cranberries!This is perfect for me! 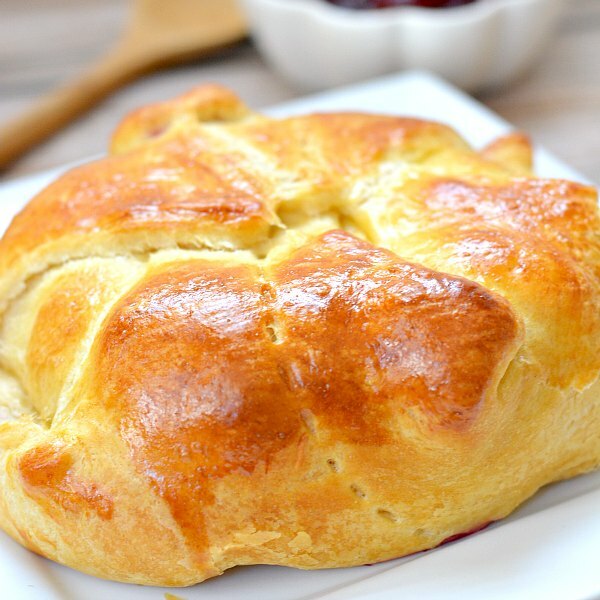 I love baked brie – this is a great recipe! Thanks for sharing at the What’s for Dinner Party! Is the calorie content correct????? 2714 calories per serving???? That is extremely high. The fat calories are 1085 Per serving. Also extremely high. It looks delicious but I am not going to eat anything that is that high in calories. That is just a heart attack waiting to happen! The nutrition info is auto calculated by the site. 🙂 Thanks! could you fully prepare up to baking it beforehand? like a couple of hours ahead? I’m not sure. The crescent roll dough doesn’t hold it’s shape very well. I’d be concerned that it’d fall off. Delicious. I baked mine at 375 for 40 minutes and it came out very brown. Not burned but brown. I’ll probably do 30 minutes next time. how many does this feed? Is it a single serving appetizer? It’s just 1 round of brie so I guess it depends on how much people will eat. But it’s a normal size brie. I’d say maybe 6 people, but that’s just guessing and assuming it’s an appetizer. YUM! 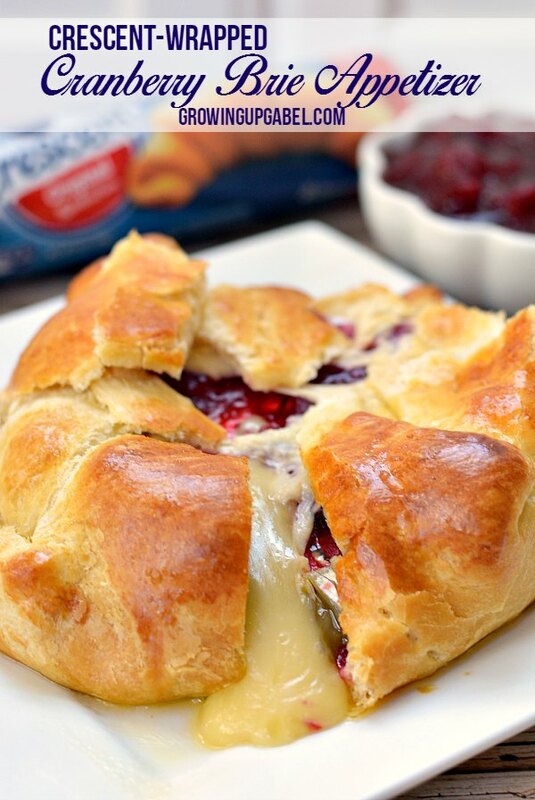 I love brie and cranberries…this looks SO good! 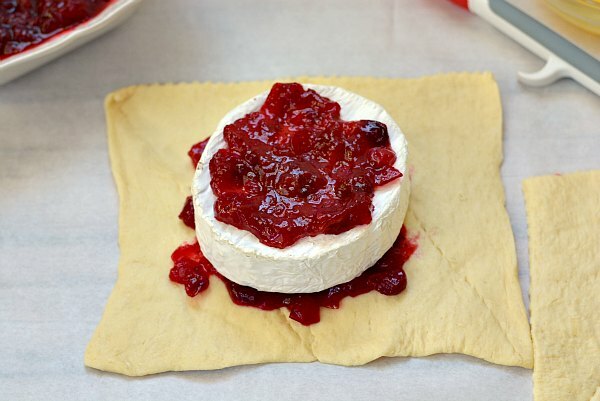 Wow, this cranberry brie appetizer looks amazing! Thanks for linking up at the #HomeMattersParty. Hope to see you at this week’s party, the door is open Friday at midnight EST. Can this be made ahead, frozen, and then baked? No, it has to be made and served immediately. Boy, does this make my mouth water, Camille! Congratulations – you’re one of our Featured Guests at this week’s party! This is such an elegant appetizer and I bet it tastes amazing! I am adding it to my Thanksgiving menu for sure. Pinned and sharing! Thanks for sharing on Family Joy Blog Link-Up Party this week. Hope you will join us again on Sunday at 12 EST. Oh my goodness! This sounds amazing!! I had a similar recipe a few summers ago and thought how hard it looked to make. But seeing your pictures and step by step instructions it looks incredibly easy! Making this for our Thanksgiving meal! Thanks for sharing on the What’s for Dinner link up and don’t forget to leave a comment at the party – Next week’s features that also leave a comment get pinned, yummed and tweeted! Thank you Camille and have a great week!